Doug “Rat Man” Rattmann is one of the most important characters in Portal, though he didn’t appear in either game. The message-scrawling scientist made his video game debut in Lego Dimensions’ Portal level pack, though he’s so well hidden it took more than a year to find him. Doug is the guy responsible for the art found in the crawlspaces tucked behind the pristine white walls of the Aperture testing center. 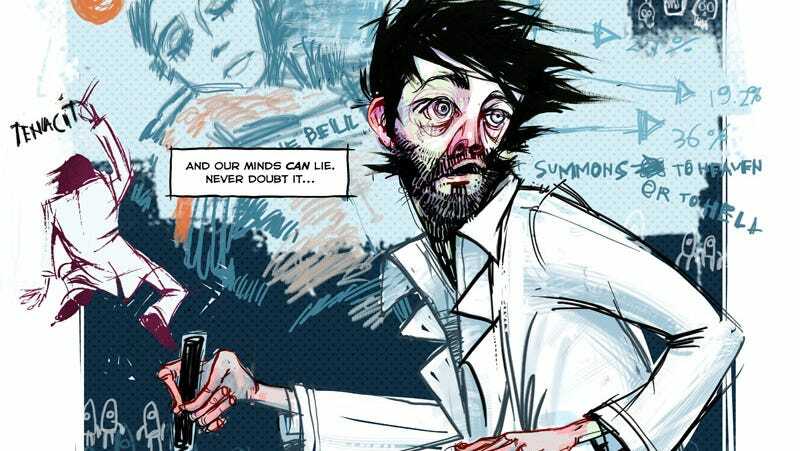 He’s the one who wrote “The Cake Is A Lie.” Doug’s story unfolds mainly in the Portal 2: Lab Rat comic, where it is revealed that he was the last surviving human employee in the facility after GLaDOS’ initial culling, and would have been a test subject himself had he not chosen Chell for the task. His guilt drives him to aid Chell as she undergoes testing in the first Portal game, and when she is dragged back into the facility at the end of the first game, Doug eschews freedom and follows her back down, saving her life by keeping her cryo chamber powered, leading to the events of Portal 2. Image via the Portal Wiki. Lego Dimensions players have been scouring the game for secrets since its original September 2015 release. Today marks the release of the second installment of new content for the game’s second season, including the introduction of Sonic the Hedgehog. There are tons of new content coming (with cool new easter eggs as well), but players still haven’t uncovered everything from the first round. Back in September of this year, more than a year since launch, TT Games producer Mark Warburton teased that there were still undiscovered secrets lurking in Lego Dimensions. The Lego community leapt into action, following clues that pointed to the possible inclusion of one Doug Rattman in the Portal adventure level of the game. Yesterday the folks at Bricks to Life (via Eurogamer) announced that Doug Rattmann had be found in four different places. Lego Doug Rattmann really doesn’t want to be seen, so all four appearances are very fleeting. The first, seen above, cannot be witnessed without a speed boosted flying vehicle, and even then he’s only on screen for a second. In other locations he’ll pop out of sight if you get too close, which is exactly what one would suspect of a mentally destroyed scientist living in the walls of an intelligent deathtrap. Check out the video below for how to find Doug in Lego Dimensions. I’ll be checking out the latest wave of figures and sets this weekend, so look for more on Monday!